The Sire des Lointaines Isles (Lord of the Distant Isles) appears for the first time in Arthurian literature in the early-thirteenth-century Prose Lancelot, the central work in the series of anonymous French prose romances collectively called the Lancelot-Grail or Arthurian Vulgate Cycle . . . 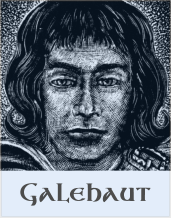 It is certain that the fictional hero Lancelot existed--possibly in Wales--before the twelfth century when Chrétien de Troyes wrote The Knight of the Cart. 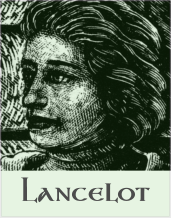 In that French verse romance, Lancelot is already in love with Queen Guenevere . . . 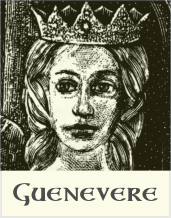 It was said of Queen Guenevere that everyone who came into her presence was ennobled. 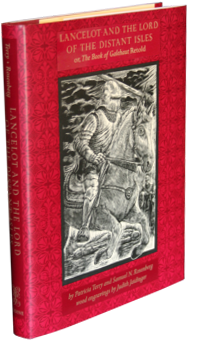 This can be taken as simply another way of saying that she was supremely beautiful; certainly there is no indication in the Prose Lancelot, the chief source of our retelling, that her influence led to any nobility of action . . . 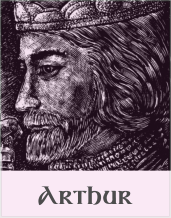 The King Arthur of legend who led the Britons to victory over the Saxons, ruler of Camelot, creator of the Round Table whose knights were pledged to right the wrongs of the world—by the time of our story all this has become a façade . . .